The City of Los Angeles, known also as "L.A.," is the most populous city in the state of California and the second-most populous in the United States. It is an alpha world city having a population of approximately 4 million people and spanning 498 square miles. According to the U.S. Census Bureau, the Los Angeles metropolitan area has a total area of 4,850 square miles and is home to roughly 13 million people. Los Angeles was founded in 1781 by Spanish missionaries, yet it was not incorporated as a municipality until April 4, 1850—five months before California achieved statehood. It is the county seat of Los Angeles County. The Los Angeles coastal area was inhabited by the Tongva (or Gabrieleños), Chumash, and earlier Native American nations for thousands of years. The Spanish arrived in 1542, when Juan Cabrillo visited the area. In 1769, Gaspar de Portolà led an expedition across southern California with Franciscan Padres Junípero Serra and Juan Crespi. In 1771, Father Serra had the Mission San Gabriel Arcángel built near Whittier Narrows in today's nearby San Gabriel Valley. On September 4, 1781, a group of 46 Spanish and Mexican settlers from Sonora set out from the San Gabriel mission to establish a settlement along the banks of the Porciúncula River (now Los Angeles River). These settlers were of African, Indian, Filipino, and Spanish ancestry, of whom two-thirds were mulatto. They created a "sub-mission" known as the Mission Nuestra Señora Reina de los Angeles. The new governor of California, Felipe de Neve, recommended to the viceroy in Mexico that the site be developed into a pueblo (town). The area was duly named "El Pueblo de Nuestra Señora la Reina de los Angeles del Río de Porciúncula," ("The Town of Our Lady the Queen of the Angels on the River Porciúncula"). It remained a small ranch town for decades, but by 1820 the population had increased to about 650 residents, making it the largest civilian community in Spanish California. Today the outline of the Pueblo is preserved in a historic monument familiarly called Olvera Street, formerly Wine Street, which was named after Agustin Olvera. Mexico's independence from Spain was achieved in 1821, and the pueblo continued as a part of Mexico. Mexican rule ended during the Mexican-American War, when Americans took control of the fledgling city after the Battle of Rio San Gabriel in 1847. The Treaty of Cahuenga, signed a few days after the battle, ended hostilities in California, and in the later Treaty of Guadalupe Hidalgo (1848), Mexico formally ceded Alta California and other territories to the United States. Americans solidified control over the city after they flooded into California during the California Gold Rush and secured the subsequent admission of California into the United States. Los Angeles was incorporated as a city in 1850. Railroads arrived when the Southern Pacific completed its line to Los Angeles in 1876. Oil was discovered in 1892, and by 1923 Los Angeles was supplying one-quarter of the world's petroleum. Even more important to the city's growth was water. In 1913, William Mulholland completed the aqueduct that assured the city's growth. In 1915, the City of Los Angeles began annexation of dozens of neighboring communities without water supplies of their own. A largely fictionalized account of the Owens Valley Water War can be found in the 1974 motion picture Chinatown. In the 1920s the motion picture and aviation industries both flocked to Los Angeles and helped to further develop it. Los Angeles is also known to be the home of the Ross-Loos Medical Group, founded in 1929, which is considered to be the first Health Maintenance Organization in the United States. The city was the proud host of the 1932 Summer Olympics and along with it the development of Baldwin Hills, the original Olympic Village. This period also saw the arrival of the exiles from the increasing pre-war tension in Europe, including such notables as Thomas Mann, Fritz Lang, Bertolt Brecht, Arnold Schoenberg, and Lion Feuchtwanger. World War II brought new growth and prosperity to the city, although many of its Japanese-American residents were transported to internment camps for the duration of the war. The postwar years saw an even greater boom as urban sprawl expanded into the San Fernando Valley. The Watts riots in 1965 showed the nation the deep racial divisions that the city faced. In 1969, Los Angeles was one of two "birthplaces" of the Internet, as the first ARPANET transmission (the Internet's ancestor) was sent from UCLA to SRI in Menlo Park. The XXIII Olympiad was successfully hosted in Los Angeles in 1984. The city was once again tested by the 1992 Los Angeles riots and the 1994 Northridge earthquake and by a city-wide vote on San Fernando Valley and Hollywood secession that was defeated in 2002. Now, urban redevelopment and gentrification have been taking place at a furious pace in various parts of the city, most notably Downtown, which is poised to be the home of many more cultural and entertainment institutions than ever before. According to the United States Census Bureau, the city has a total area of 498.3 square miles (1,290.6 km²)—469.1 square miles (1,214.9 km²) of it is land and 29.2 square miles (75.7 km²) of it is water. The total area is 5.86% water. The extreme north-south distance is 44 miles (71 km), the extreme east-west distance is 29 miles (47 km), and the length of the city boundary is 342 miles (550 km). The land area is the 9th largest among cities in the Continental United States. The highest point in Los Angeles is Sister Elsie Peak (5,080 feet) at the far reaches of the northeastern San Fernando Valley, part of Mt. Lukens. The Los Angeles River is a largely seasonal river flowing through the city, with headwaters in the San Fernando Valley. Its length is almost entirely lined in concrete. The Los Angeles area is remarkably rich in native plant species. With its beaches, dunes, wetlands, hills, mountains, and rivers, the area contains a number of important biological communities. The largest area is coastal sage scrub, which covers the hillsides in combustible chaparral. Native plants include: California poppy, matilija poppy, toyon, coast live oak, giant wild rye grass, and hundreds of others. Unfortunately, many native species are so rare as to be endangered, such as the Los Angeles sunflower. 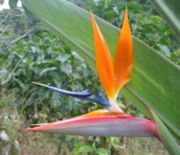 There are many exotic flowers and flowering trees that are blooming year-round, with subtle colors, including the jacaranda, hibiscus, phlox, bougainvillea, coral tree blossoms and bird of paradise. If there were no city here, flower-growing could still flourish as an industry, as it does in Lompoc. Wisteria has been known to grow to house-lot size, and in Descanso Gardens there are forests of camellia trees. Orchids require special attention in this Mediterranean climate. Like most areas of coastal California, Los Angeles is subject to earthquakes, due to its proximity to the San Andreas Fault, as well as to the smaller San Jacinto and Banning faults. The most recent major earthquake was the 1994 Northridge earthquake, which was centered in the northern San Fernando Valley. Coming less than two years after the 1992 riots, the Northridge earthquake was an emotional shock to Southern Californians, and caused physical damage totalling billions of dollars. Other major earthquakes in the Los Angeles area include the 1987 Whittier Narrows earthquake, the 1971 Sylmar earthquake, and the 1933 Long Beach earthquake. Nevertheless, most earthquakes are relatively minor. Many areas in Los Angeles witness one or two minor earthquakes per year, usually inflicting little or no damage. Imperceptible quakes are detected by seismometers on a daily basis. Generally, the city is divided into the following areas: Downtown L.A., East L.A., South Los Angeles, the Harbour Area, Hollywood, Wilshire, the Westside (which includes Westwood, Brentwood, West Los Angeles, and Venice as well as the cities of Santa Monica, and parts of West Hollywood and Beverly Hills), and the San Fernando and Crescenta valleys. In the last ten years, "Eastside" has appeared as a new designation to contrast with the more traditional "Westside" description (though many Angelenos reject the term as a trendy East Coast import). Some well-known communities of Los Angeles include Venice Beach, the Downtown Financial District, Los Feliz, Silver Lake, Hollywood, Hancock Park, Koreatown, and the extremely affluent areas of Bel-Air, Hollywood Hills, Pacific Palisades, Holmby Hills, and Brentwood to name a few. The city is situated in a Mediterranean climate or subtropical zone, experiencing mild, reasonably wet winters and warm to hot, mildly humid summers. Generally the weather is dry in all seasons, but can be relatively cold in the winter. Breezes from the Pacific Ocean tend to keep the beach communities of the Los Angeles area cooler in summer and warmer in winter than those further inland, and summer temperatures can sometimes vary by as much as 25 °F warmer in the inland communities compared to that of the coastal communities. The coastal communities of Los Angeles are commonly affected by a phenomenon known as a 'marine layer', a dense cloud cover caused by the proximity of the ocean, that helps keep the temperatures cooler throughout the year. Temperatures in the summer can get well over 90 °F (32 °C), but average summer daytime highs are 85 °F (29 °C), with overnight lows of 66 °F (18 °C). Winter daytime high temperatures will get up to around 65 °F (21 °C), on average, with overnight lows of 45 °F (8 °C) and during this season rain is common. The median temperature in January is 58.3 °F (14.6 °C) and 74.3 °F (23.5 °C) in July. The highest temperature recorded within city borders was 119.0 °F (48.33 °C) in Woodland Hills on July 22, 2006; the lowest temperature recorded was 18.0 °F (−7.8 °C) in 1989, in Canoga Park. The highest temperature ever recorded for Downtown Los Angeles was 112.0 °F (44.4 °C) on June 26, 1990, and the lowest temperature ever recorded was 28.0 °F (−2.2 °C) on January 4, 1949. Rain occurs mainly in the winter and spring months (February being the wettest month) with great variations in storm severity year by year. Los Angeles averages 15 inches (381 mm) of precipitation per year. It rarely snows in the city basin, but the mountains slopes within city limits typically receive snow every year. With weather permitting, it is possible to snow ski and surf on the same day in the Los Angeles area. 2.7" * 3.1" 2.2" 1.3" 0.3" 0.1" 0.0" 0.0" 0.2" 0.4" 1.1" 2.5" 14.0"
Downtown Los Angeles on a smoggy late afternoon with Griffith Observatory in the foreground at left. Due to the city's geography making it susceptible to atmospheric inversion as well as the population's heavy reliance on automobiles as a major form of transportation, the city suffers from air pollution in the form of smog. The Los Angeles Basin and the San Fernando Valley hold in the fumes from automobiles, diesel trucks, shipping, and locomotive engines, as well as manufacturing and other sources. In addition, the groundwater is increasingly threatened by MTBE from gas stations and perchlorate from rocket fuel. Some consider urban sprawl to be a result of the city's transportation system. Unlike other large cities that rely on rain to clear smog, Los Angeles only gets 15 inches (380 mm) of rain each year, so the smog is able to accumulate over multiple consecutive days. This has brought much attention from the state of California to the need for low emissions vehicles. As a result, pollution levels have dropped markedly in recent decades. The number of Stage 1 smog alerts has declined from over 100 per year in the 1970s to almost zero in the new millennium. Despite this remarkable success, the 2004 annual report of the American Lung Association ranks the city as the most polluted in the country with short-term particle pollution, year-round particle pollution, and ozone pollution. Smog from the basin is pushed towards the mountains, where the pollutants harm trees. However, even more aggressive steps are now being taken to improve the air quality in the years to come. The city is governed by a mayor-council system. The current mayor is Antonio Villaraigosa. There are 15 city council districts. Other elected city officials include the City Attorney, Rocky Delgadillo, and the City Controller, Laura Chick. The city attorney prosecutes misdemeanors within the city limits. The district attorney, elected by county voters, prosecutes misdemeanors in unincorporated areas and in 78 of the 88 cities in the county, as well as felonies throughout the county. The Los Angeles Police Department (LAPD) polices the city of Los Angeles, but the city also maintains three specialized police agencies; The Office of Public Safety, within the General Services Department (which is responsible for security and law enforcement services at city facilities throughout the city, including City Hall, city parks and libraries, the Los Angeles Zoo, and the Convention Center), the Port Police, within the Harbour Department (which is responsible for land, air and sea law enforcement services at the Port of Los Angeles), and the Airport Police, within the Los Angeles World Airports Department (which is responsible for law enforcement services at all four city-owned airports, including Los Angeles International Airport (LAX), Ontario International Airport (ONT), Palmdale Regional Airport (PMD), and Van Nuys Airport (VNY), the largest general aviation airport in the country). The LAPL, Los Angeles Public Library System and Los Angeles Unified School District (LAUSD) are among the largest such organizations in the country. The LAUSD is the second largest school district in the United States; only the New York City Department of Education is larger. The Los Angeles Department of Water and Power provides service to city residents and businesses. The city government has been perceived as inefficient and ineffective by residents of some areas, which led to an unsuccessful secession movement by the San Fernando Valley and Hollywood in 2002. The campaign to defeat secession was led by then Mayor James Hahn. The most often raised complaint is that city administration in Downtown gives priority to high-density neighborhoods like Mid-City and Downtown at the expense of its far-flung suburban neighborhoods. To promote public participation in government and make government more responsive to local needs, voters created neighbourhood councils in the Charter Reform of 1999. The councils were first proposed by City Council member Joel Wachs in 1996 and were hotly contested for a number of years. Indeed, they are still hotly contested ten years later. 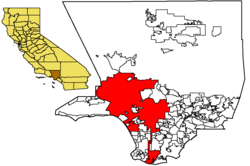 The councils cover districts which are not necessarily identical to the traditional neighborhoods of Los Angeles, the borders of which often reflect those of cities that were annexed to Los Angeles. 86 neighbourhood councils are currently certified and all " stakeholders" – meaning anyone who lives, works or owns property in a neighbourhood – may vote for council members. Participation in NC elections has, for the most part, been proportionally as narrow as in city, state and federal elections. Though the councils are strictly advisory, and have little actual power, they are still official government bodies and so must abide by California's Brown Act, which strictly governs the meetings of deliberative assemblies. These and other regulatory requirements have proven frustrating for some activists unaccustomed to bureaucratic procedures. For those with organizing experience, or the administrative ability to overcome regulatory hurdles, the councils have been effective advocates for community interests. The first notable achievement of the neighbourhood councils, collectively, was their organized opposition in March 2004 to an 18% increase in water rates by the Department of Water and Power (a municipal monopoly), which led the City Council to approve only a limited increase pending independent review. More recently, the councils petitioned the City Council in summer, 2006 to allow them to independently introduce ideas for legislative action, but the City Council voted to give the idea further study (this, despite 18 months of committee hearings). As Mayor, James Hahn provided each council with $50,000 for any project of their choice and an additional $100,000 for street improvements in their neighbourhood. These financial commitments have been maintained by current Mayor Antonio Villaraigosa. The economy of Los Angeles is driven by international trade, entertainment (television, motion pictures, recorded music), aerospace, agriculture, petroleum, and tourism. 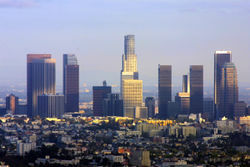 Los Angeles is also the largest manufacturing centre in the United States. The contiguous ports of Los Angeles and Long Beach together comprise the most significant port in North America and one of the most important ports in the world, and they are vital to trade within the Pacific Rim. Other significant industries include media production, finance, telecommunications, law, health and medicine, and transportation. The city is home to three major Fortune 500 companies, including aerospace contractor Northrop Grumman, energy company Occidental Petroleum Corporation, and homebuilding company KB Home. Other companies headquartered in Los Angeles include Twentieth Century Fox, Latham & Watkins, Univision, Metro Interactive, LLC, Premier America, CB Richard Ellis, Gibson, Dunn & Crutcher LLP, Guess?, O'Melveny & Myers LLP, Paul, Hastings, Janofsky & Walker LLP, Tokyopop, The Jim Henson Company, Paramount Pictures, Robinsons-May, Sunkist, Fox Sports Net, Health Net, Inc., 21st Century Insurance, and The Coffee Bean & Tea Leaf. The metropolitan area contains the headquarters of even more companies, many of whom wish to escape the city's high taxes. For example, Los Angeles charges a gross receipts tax based on a percentage of business revenue, while most neighboring cities charge only small flat fees. The companies below clearly benefit from their proximity to Los Angeles, while at the same time avoiding the city's taxes (and other problems). Some of the major companies headquartered in the cities of Los Angeles county are Shakey's Pizza ( Alhambra), Academy of Motion Picture Arts and Sciences ( Beverly Hills), City National Bank (Beverly Hills), Hilton Hotels (Beverly Hills), DiC Entertainment ( Burbank), The Walt Disney Company ( Fortune 500 – Burbank), Warner Bros. (Burbank), Countrywide Financial Corporation (Fortune 500 – Calabasas), THQ (Calabasas), Belkin ( Compton), Sony Pictures Entertainment (parent of Columbia Pictures, located in Culver City), Computer Sciences Corporation (Fortune 500 – El Segundo), DirecTV (El Segundo), Mattel (Fortune 500 – El Segundo), Unocal (Fortune 500 – El Segundo), DreamWorks SKG ( Glendale), Sea Launch ( Long Beach), ICANN ( Marina Del Rey), Cunard Line ( Santa Clarita), Princess Cruises (Santa Clarita), Activision ( Santa Monica), and RAND (Santa Monica). The L.A. area is also home to the U.S. headquarters of all but two of the major Asian automobile manufacturers ( Nissan North America is in the process of relocating its headquarters from Gardena to the Nashville area, and Subaru's U.S. operations are based in Cherry Hill, New Jersey). Further, virtually all the world's automakers have design and/or tech centers in the L.A. region. There are many other well-known companies with headquarters located in the County of Los Angeles or the greater Los Angeles area, but they are far beyond the City of Los Angeles (and the scope of this article). Downtown Los Angeles is also the home of the Los Angeles Convention Centre which hosts many popular events including the annual LA Auto Show in January. 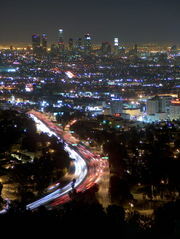 Los Angeles at night, photographed from Mulholland Drive. As of the census GR2 of 2000, there were 3,694,820 people, 1,275,412 households, and 798,407 families residing in the city. The population density was 7,876.8 people per square mile (3,041.3/km²). There were 1,337,706 housing units at an average density of 2,851.8 per square mile (1,101.1/km²). The racial makeup of the city (As of 2005) was 28% White, 20% African American, 0.4% Native American, 11.1% Asian, 0.3% Pacific Islander, 26.9% from other races, and 2.4% from two or more races. 47% of the population were Hispanic or Latino of any race and 28.5% were White, not of Latino/Hispanic origins. Los Angeles is home to one of the largest communities of Asian Americans and Latin Americans of any city in the United States. There is also a fairly large Armenian population, but does not compare to the number of Armenians in Glendale. There were 1,275,412 households of which 33.5% had children under 18, 41.9% were married couples, 14.5% had a female householder with no husband present, and 37.4% were non-families. 28.5% of households were made up of individuals and 7.4% had someone living alone who was 65 years of age or older. The average household size was 2.83 and the average family size 3.56. The age distribution was: 26.6% under 18, 11.1% from 18 to 24, 34.1% from 25 to 44, 18.6% from 45 to 64, and 9.7% who were 65 or older. The median age was 32. For every 100 females there were 99.4 males. For every 100 females age 18 and over, there were 97.5 males. The city's gross population density statistic is deceptively low, because of the sparsely-inhabited Santa Monica Mountains which separate the Los Angeles Basin from the San Fernando Valley. South of the Santa Monica Mountains, the population density throughout most of the city is much greater than 7,876.8 people per square mile (3,041.3/km²). Los Angeles has some of the most densely-populated urban land in the United States. Hollywood Boulevard, Fairfax Avenue and Vernon Avenue provides a good example. The land area, 50 square miles (130 km²), is only slightly larger than San Francisco but, according to U.S. Census Bureau data, this region housed about 30% more people in 2000 (more than 1,000,000). It is also of interest to note that the post-1950 population increase did not occur exclusively in suburban or peripheral locations. The increase in the central area population—while many other American cities have experienced central area population declines—is due in part to Los Angeles' large immigrant population. In the period from 1920 to 1960, African Americans from the Southeast U.S. arrived in Los Angeles and its population grew 15 times. Since 1990, the African American population dropped in half as its middle class relocated to the suburbs, notably the Antelope Valley and Inland Empire and Latinos have moved into the once predominantly African American district of South Los Angeles. African Americans still remain predominant in some portions of the city, including Crenshaw District, Leimert Park, and Baldwin Hills (as well as neighboring View Park-Windsor Hills and Ladera Heights) which is considered to be one of the wealthiest majority-black neighborhoods in the United States. Los Angeles still has the largest African-American community of any city in western United States. Also many other websites say that African Americans make up about 25% of L.A.
Of 2,182,114 U.S.-born people, 1,485,576 were born in California, 663,746 were born in a different state of the United States, and 61,792 were born in a United States territory (Puerto Rico, Guam, U.S. Virgin Islands, or Northern Marianas). Of 1,512,720 foreign born people, 100,252 were born in Europe, 376,767 were born in Asia, 64,730 were born in Africa, 94,104 were born in Caribbean/Oceania, 996,996 were born in Latin America, and 13,859 were born in Northern America. Of such foreign-born people, 569,771 entered between 1990 to March 2000. 509,841 are naturalized citizens and 1,002,879 are not citizens. By the next national census, Los Angeles is expected to have a Latino majority for the first time since 1850. The city has the second largest percentage of foreign-born citizens of any major U.S. city, after Miami. The Los Angeles International Airport (LAX) is the number one entry for immigrants in the country. The Hispanic (Mexico, Central America and South America), Asian American, and Caribbean populations are growing particularly quickly — the Asian-American population is the largest of any city in the U.S and the city contains the largest concentration of Los Angeles County's 1.4 million Asians. 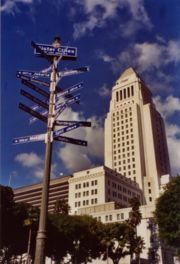 Los Angeles hosts the largest populations of Armenians, Bulgarians, Ethiopians, Filipinos, Guatemalans, Salvadorans, Nicaraguans, Hungarians, Koreans, Mexicans, Pacific Islanders such as Samoans, Russians and Thais in the country, and in the world outside of their respective countries. Los Angeles is also home to the largest populations of Japanese and Persians living in the U.S., and has one of the largest Native American populations in the country. L.A. had experienced minor waves of European immigration in the late 1800s/early 1900s and the city has some Americans of German, Greek, Irish, Italian, Polish and Ukrainian descent. Los Angeles is home to people from more than 140 countries, who speak at least 224 different languages. Ethnic enclaves like Chinatown, Historic Filipinotown, Koreatown, Little Armenia, Little Ethiopia, Little Persia, Little Tokyo, and Thai Town provide examples of the polyglot character of Los Angeles. Los Angeles is home to adherents of many religions, and has over 100 Christian denominations, with Roman Catholicism being the largest due to the high numbers of Hispanic and Irish Americans. The Roman Catholic Archbishop of Los Angeles leads the largest archdiocese in the country. Roger Cardinal Mahony oversaw construction of the Cathedral of Our Lady of the Angels, completed in 2002 at the north end of downtown. The Los Angeles Temple of The Church of Jesus Christ of Latter-day Saints is their second-largest temple and is located in West Los Angeles. L.A. had a wave of Mormon settlers in the 1860s to generate a fairly large community of members of that church. Los Angeles is home to the third largest population of Jewish people in the United States. Many synagogues of the Reform, Conservative, Orthodox, and Reconstructionist movements can be found throughout the city. Most are located in the San Fernando Valley and West Los Angeles. The area in West LA around Fairfax and Pico Boulevards contains a large amount of Orthodox Jews. The oldest synagogue in Los Angeles is the Breed Street Shul in East Los Angeles, which is currently being renovated. The Azusa Street Revival (1906–1909) in Los Angeles was a key milestone in the history of the Pentecostal movement. Not long after Christian Fundamentalism received its name and crucial promotion in Los Angeles. In 1909, the Bible Institute of Los Angeles (B.I.O.L.A. now Biola University) published and widely distributed a set of books called The Fundamentals, which presented a defense of the traditional conservative interpretation of the Bible. The term fundamentalism is derived from these books. In the 1920s, Aimee Semple McPherson established a thriving evangelical ministry, with her Angelus Temple in Echo Park open to both black and white church members of the Foursquare Church. Billy Graham became a celebrity during a successful revival campaign in Los Angeles in 1949. Herbert W. Armstrong's Worldwide Church of God used to have its headquarters in nearby Pasadena, now in Glendale. Until his death in 2005, Dr. Gene Scott was based near downtown. The Metropolitan Community Church, a fellowship of Christian congregations with a focus on outreach to gays and lesbians, was started in Los Angeles in 1968 by Troy Perry. Jack Chick, of " Chick Tracts", was born in Boyle Heights and lived in the area most of his life. Because of Los Angeles's large multi-ethnic population, there are numerous organizations in the area representing a wide variety of faiths, including Islam, Buddhism, Hinduism, Zoroastrianism, Sikhism, Bahá'í, various Eastern Orthodox Churches, Sufism and others. Immigrants from Asia for example, have formed a number of significant Buddhist congregations making the city home to the biggest variety of Buddhists in the world. There are over 300 temples in Los Angeles. Los Angeles has been a destination for Swamis and Gurus since as early as 1900, including Paramahansa Yogananda (1920). The Self-Realization Fellowship is headquartered in Hollywood and has a private park in Pacific Palisades. Los Angeles is the home to a number of Neopagans, as well as adherents of various other mystical religions. One wing of the Theosophist movement is centered in Los Angeles, and another is in neighboring Pasadena. Maharishi Mahesh Yogi founded the Transcendental Meditation movement in Los Angeles in the late 1950s. The Kabbalah Centre is in the city. The Church of Scientology has had a presence in Los Angeles since it opened February 18, 1954, and it has several churches, museums, and recruiting sites in the area, most notably the Celebrity Centre in Hollywood, in fact the world's largest community of Scientologists can be found in LA. The COMPSTAT unit of the LAPD tabulates Part I offenses (violent and property crimes) committed in the city. Los Angeles has been experiencing significant decline in Part I offenses since the mid-1990s, and hit a record low in 2005, with 43,231 acts of violence, of which 487 were homicides. Criminality peaked in 1992 with 72,667 recorded acts of violence, of which 1,096 were homicides; and 245,129 recorded property crimes. The distribution of homicides in the city is uneven with nearly half of such crimes occurring in the four stations of the South Bureau of the LAPD encompassing South Los Angeles and the Harbour area. A further quarter occur in the areas covered by the Central Bureau which covers Downtown and its environs. Property crimes were three times more common than violent crimes; 110,231 were recorded in 2005. Despite negative stereotypes, when compared to other large cities, Los Angeles fares relatively well, with a total crime index lower than that of San Francisco, Chicago, and Boston. Also, among the largest cities in the United States, only New York City has a lower overall crime rate . Many movies and songs about Los Angeles depict the notion that the city is home to a large number of gangsters and professional criminals. According to a May 2001 Drug Threat Assessment by the National Drug Intelligence Centre, Los Angeles County is home to 152,000 gang members organized into 1,350 gangs. Car chases happen more often than in most other major cities, with the city's complex freeway system allowing for lengthier pursuits. Other autmobile-oriented crimes include: car-to-car shootings, drive-by shootings, hit-and-run accidents, and carjackings. The people of Los Angeles are known as Angelenos. Nighttime hotspots include places such as Downtown Los Angeles, Silver Lake, Hollywood, and West Hollywood, which is the home of the world-famous Sunset Strip. Disney Hall, designed by Frank Gehry. Some well-known shopping areas are the Hollywood and Highland complex, the Beverly Centre, The Grove, Melrose Avenue, and Robertson Boulevard. The famous Hollywood sign, a symbol of the city's world famous entertainment culture. The city also offers several cultural institutions, and some of the most notable include the Los Angeles County Museum of Art (LACMA), the Getty Centre and Villa, the Museum of Contemporary Art (MOCA), the Museum of Neon Art (MONA), the Norton Simon Museum, the Museum of Tolerance, the Skirball Cultural Centre, the Latino Museum of History, Art, and Culture, the George C. Page Museum, the Japanese American National Museum, the California Science Centre, and the Natural History Museum of Los Angeles County. There are also numerous smaller art galleries throughout the area, most noticeably in West Hollywood and Santa Monica. There are many venues for the performing arts such the Music Centre of Los Angeles County (consisting of the Dorothy Chandler Pavilion, home of the Los Angeles Opera, the Ahmanson Theatre, which hosts big Broadway-style productions, and the Mark Taper Forum), the Ford Amphitheatre, the Greek Theatre, the Hollywood Bowl, the Pantages Theatre, and the new home of the Academy Awards, the Kodak Theatre. The city also has many smaller theaters such as the famous Actors Gang Theatre and the Coronet Theatre. Architectural landmarks in the city include the Walt Disney Concert Hall (home to the Los Angeles Philharmonic Orchestra), the Cathedral of Our Lady of the Angels, and the Bradbury Building. Important works of Frank Lloyd Wright (the " Hollyhock House"), Richard Neutra, and other well-known architects are found throughout the city. There is also a current renaissance of downtown Los Angeles as an arts and entertainment district, with the restoration and development of historic buildings, Broadway theaters, and businesses such as restaurants and clubs. A number of new residents are migrating to downtown, with the construction of hundreds of new penthouses and lofts. Residents of the city of Los Angeles are served by the Los Angeles Public Library (LAPL) and its branch locations. Residents of the unincorporated areas of Los Angeles County and various cities within the county are served by the County of Los Angeles Public Library The LAPL is funded by voter-approved bond and tax levy packages. 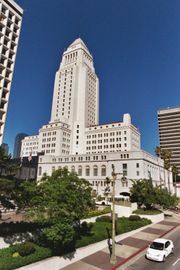 The Central Library is located in downtown Los Angeles and has been recognized as a National Historic Site. Los Angeles is the home of the Los Angeles Dodgers of Major League Baseball, the Los Angeles Kings of the NHL, the Los Angeles Lakers and Los Angeles Clippers of the NBA, the Los Angeles Sparks of the WNBA, the Los Angeles Galaxy and Club Deportivo Chivas USA of Major League Soccer, the Los Angeles Riptide of Major League Lacrosse, and the Los Angeles Avengers of the Arena Football League. Los Angeles has been without an NFL franchise since 1995 despite being the second-biggest television market in North America. Prior to 1995, the Rams (1946-1994) and the Raiders (1982-1994) of the NFL were in the Los Angeles market. The Los Angeles Angels of Anaheim and Anaheim Ducks are both based in nearby Anaheim. Beach volleyball and windsurfing were both invented in the area (though predecessors of both were invented in some form by Duke Kahanamoku in Hawaii). Venice, also known as Dogtown, is credited with being the birthplace of skateboarding and the place where Rollerblading first became popular. Area beaches are popular with surfers, who have created their own subculture. Los Angeles has twice played host to the summer Olympic Games, in 1932 and in 1984. When the tenth Olympic Games were hosted in 1932, the former 10th Street was renamed Olympic Blvd. The 1984 Summer Olympics inspired the creation of the Los Angeles Marathon, which has been held every year in March since 1986. Super Bowls I and VII were also held in the city as well as soccer's international World Cup in 1994. Los Angeles is also hoping to be the host of the 2016 Olympics. The Los Angeles area contains varied topography, notably the hills and mountains rising around the metropolis, making Los Angeles the only major city in the United States bisected by a mountain range; four mountain ranges extend into city boundaries. Thousands of miles of trails crisscross the city and neighboring areas, providing opportunities for exercise and wilderness access on foot, bike, or horse. Across the county a great variety of outdoor activities are available, such as skiing, rock climbing, gold panning, hang gliding, and windsurfing. Numerous outdoor clubs serve these sports, including the Angeles Chapter of the Sierra Club, which leads over 4,000 outings annually in the area. Los Angeles also boasts a number of sports venues, including the STAPLES Centre, a sports and entertainment complex that also hosts concerts and awards shows such as the Grammys. Los Angeles has one of the largest freeway systems in the world, with 27 intertwining freeways handling millions of commuters as they journey a daily collective migration of about 100 million miles (160 million km). Los Angeles is the most car-populated metropolis in the world with 1.8 registered automobiles per licensed driver. The Los Angeles County Metropolitan Transportation Authority and other agencies operate an extensive system of bus lines, as well as subway and light rail lines. True to reputation, Los Angeles' rail system does not have high ridership, averaging 276,900 trips a day, 0.4% of the 65 million taken daily. This compares with ridership of 699,599 trips for Washington Metrorail's subway, 664,700 trips for Boston's subway T, the city of Chicago's L with 644,200, and New York City's 6.0 million average daily weekday trips taken. Adding in trips taken by bus raises this number to about 1.7 million. The rail system includes the Red Line subway, the Gold, Blue, and Green light rail lines, and the Orange Line, a bus rapid transit line. The special red Metro Rapid buses have also been highly touted as a prime example of a successful bus transit program since these buses operate like a rail line and run through the best-known parts of the city. However, during rush hour, they are apt to get mired in gridlock along with other vehicles, and the traffic signal holding or changing capability is of little help. Currently under construction is an eastside extension of the Gold Line. In the works is a new rail line called the Expo Line. Momentum is slowly building to extend the subway under Wilshire Boulevard all the way to the ocean in Santa Monica, extending the city's public transportation system further. Rail passenger service is provided by Amtrak and Metrolink from historic Union Station. Rail shipping is handled by Union Pacific Railroad and BNSF Railway. The Los Angeles metropolitan area is served by more airports than any major city in the world, with 5 major commercial airports, and many more general-aviation airports. The main Los Angeles airport is Los Angeles International Airport ( IATA: LAX, ICAO: KLAX), the fifth busiest commercial airport in the world. LAX handled 55 million passengers and 2 million tons of cargo in 2003. Other major commercial airports include Ontario International Airport ( IATA: ONT, ICAO: KONT), Bob Hope Airport ( IATA: BUR, ICAO: KBUR), formerly known as Burbank Airport, Long Beach Municipal Airport ( IATA: LGB, ICAO: KLGB), and John Wayne Airport ( IATA: SNA, ICAO: KSNA) of Orange County. Los Angeles also has the world's busiest general-aviation airport, Van Nuys Airport ( IATA: VNY, ICAO: KVNY). The sea ports of the Port of Los Angeles and Port of Long Beach together make up the Los Angeles – Long Beach Harbour, the busiest and overall third-largest container shipping port in the world. There are also smaller, non-industrial harbors along L.A.'s coastline. Most of these contain sailboats and yachts, like Redondo Beach and Marina del Rey. There are several public colleges and universities in the city, including the University of California, Los Angeles (UCLA), California State University, Los Angeles (CSULA), California State University, Long Beach (CSULB), and California State University, Northridge (CSUN). The community college system consists of nine campuses governed by the trustees of the Los Angeles Community College District: Los Angeles City College (LACC), Los Angeles Harbour College, Los Angeles Pierce College, Los Angeles Valley College (LAVC), Los Angeles Mission College, East Los Angeles College (ELAC), West Los Angeles College, Los Angeles Southwest College, and Los Angeles Trade Technical College. Los Angeles Unified School District serves the city of Los Angeles, as well as several surrounding communities. It is the second-largest school district in the United States, with over 700,000 students. After Proposition 13 in 1978, urban school districts had considerable trouble with funding and LAUSD became known for its underfunded, overcrowded and poorly maintained campuses. Wealthy and upper-middle-class parents placed their children in elite private schools, while middle-class families fled into suburban school districts beyond LAUSD boundaries. Since then, the LAUSD has embarked on an aggressive school construction program to relieve overcrowding.